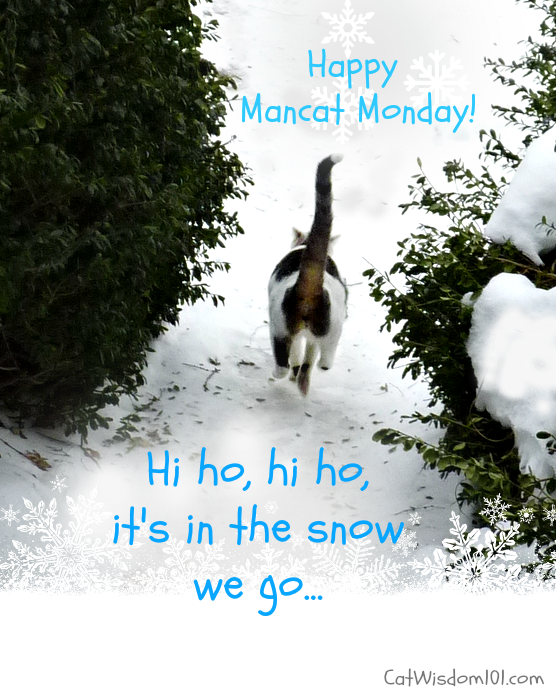 Woo, woo, woo, it’s the call of the Wilde edition of Mancat Monday with me, Odinnnnn! It was so cold last week even I only ventured outside for a measly five minutes but we got a lucky break yesterday with almost tropical temps in the 40s. Cats are opportunists and I believe in making hay or catnip while the sun shines. I galloped in the snow as happy as a pack of huskies. 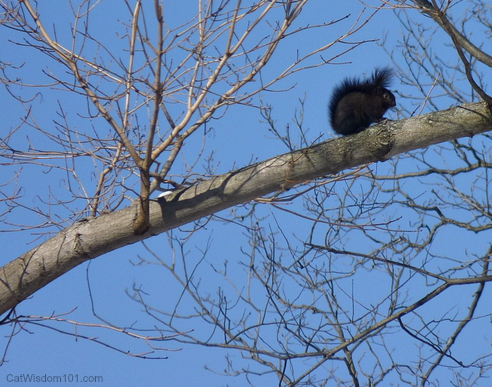 Even the birds were out and I saw the cutest little squirrel but everyone was too fast for me. Shocking I know but wait, spring training begins soon. Domino who knows a thing or two about snow and winter after braving seven winters as a former feral, will only go out if it’s warmish. Here’s an old pic of him looking winter weary. He still has his famous heavy coat and jowls but prefers to luxuriate in the comforts of a real home. Layla trekked through the deep snow (wishing she had over the knee boots) to check on the kitty memorial mounds. Coco’s is inaccessible since a tree fell down and come spring something will have to be done. 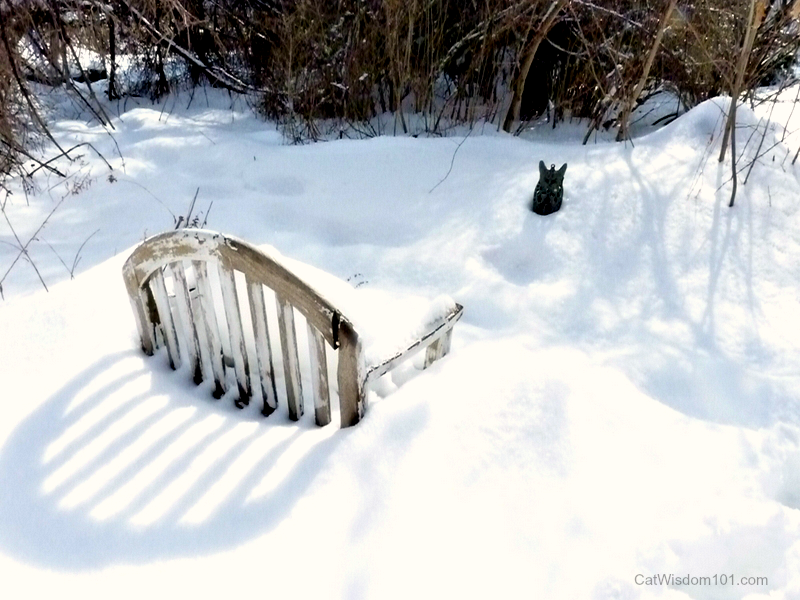 Gris Gris’ grave marker and holiday bow lay buried under the snow. It’ll be awhile before anyone can sit and visit. Winter is good for going inward, cocooning the body, mind and spirit, gestating new ideas and plans before the outward energy of spring. That’s what Merlin says but I’m more of a “live in the moment” kind of cat. Hot or cold, I want it now. I’m not sensible like my furbro Domino. He’s slowing down but hey, we’re all getting older. Mind you, he still has some mean wrestling moves. Merlin is slowing down or his decline is speeding up. Merlin, get the hell off my keyboard.ttt5tttttttttttttttttt78uuuuuuuuuuuuuuuuuuuugggggggggggggggggggggggggggggggggggggbbbbbbbbbbbvvvvvvvvvvvvvvvvvvvvvvvvvvvvvvvvvvvvvvvvvvvvvvvvvvvvvvvvvvvvvvvvvvvvvvvvvvvvvvvvvvvvvvvvvvvvvvvvvvvvvvvvvvvvvvvvvvvvvvvvvvvvvvvvvvvvvvvvvvvvvvvvvvvvvvvvvvvvvvvvvvvvvvvvvvvvvvvvvvvvvvvvvvvvvvvvvvvvvvvvvvvvvvvvvvvvvvvvvvvvvvvvvvvvvvvvvvvvvvvvvvySorry this really happened. Okay, you have Mondays With Merlin back next week. Sheesh. Anyway, he’s getting sub q fluids daily now. His poor kidneys are kaput but his mood is good and his appetite voracious. Our pawrents’ life revolves around his 24/7 schedule and lots of laundry. Someone needs to be with him all the time. It’s exhausting but that’s life with a 100-year-old baby. They’re lucky they’re able to do it but it means saying no to things like vacations. Even this blog is hanging in the balance. Layla tries to cut but back but we love it and then so many interesting things happen and so it goes. So for now we will try to cut back blogging to five days a week. Speaking of interesting things (not to me but maybe for you), you can see Layla live on a BlogPaws Google Hangout this Thursday. Bless sweet Merlin and your kitties. Lovely post. 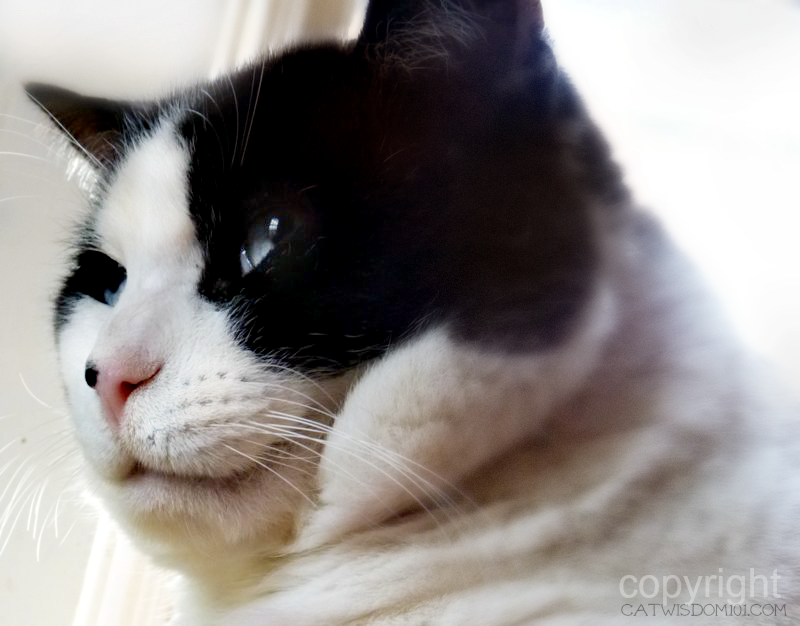 Domino, you are the most MAGNIFICENT of mancats. Odin, your joy is infectious, and Merlin, you are an inspiration. That was lots of fun…as long as I didn’t have to go out in the snow!!! I’m with you Merlin, I don’t go out on the colder days any more. You are wise to leave it to the younger ones. 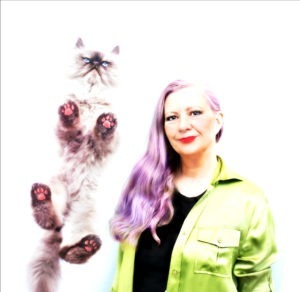 I send my purrs to you. It’s been a while since we had a failing senior in the house, but the head peep remembers how it is to put everything on hold for them. Purrs for Merlin and for the rest of you, too. Much Love and Many purrs to Merlin and his family. Merlin,we send you purrs of love and healing. We just cannot believe that you even tolerated the 42 degree stuff for even a moment!! How dreadfully insulting!!!! We love you all and wish for blessings for each one of you. The Feral Gang spent most of the day and all of the night out Sunday and were quite happy to return to the basement this morning. 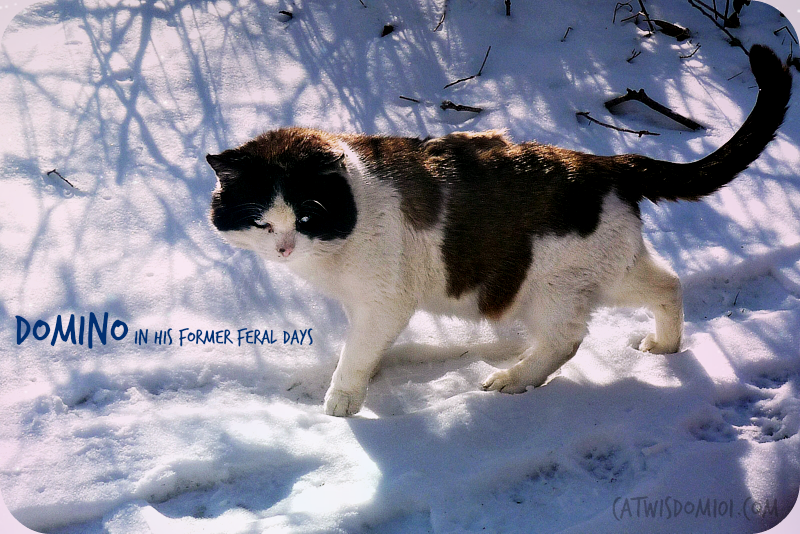 Thanks for the feral update and so happy they have proper shelter! Odin your gallop through the snow is adorable. We are purrin for Merlin but we understand the attention to detail and the exhaustion. Thanks. We know you understand having gone through it too. Great Mancat Monday post, Odin! We had a break from cold over the weekend, too. Merlin disagrees, but 42F does feel like new 72 now 🙂 Great to hear he is in good mood and eating well. And interrupting you with keyboard. Hahaha. There is such good energy and spirit in this post. Sending supportive purrs and sympathy for Merlin and his wonderful family. Odin says thanks Miss Maggie and Merlin is purring. That was yesterday. We’re back in the deep freeze today 🙁 Mind you, Odin still went out but not Domino. Nice attempt at writing Merlin- are you trying to tell us your secrets to a long life? One of these days 🙂 In this case he’s just wanting to be boss. Hey Domino! I totally get it dood. As a former “outdoor dweller” myself, I have no need to head into the frigid weather, nope, not me! The house is cozy and fine thank you very much! ~ Tipp. We send all our loves and purrs and extra energies to Merlin, that these days he knows the love that surrounds him and the blankets and sunpuddles that warm him. I have always wondered how much you do. It is amazing. So much busy-ness in life. There are days I cannot work. Days I cannot read. Days I must sleep or watch shows/movies or listen to music. It’s a daily balancing act for sure. Wow! We can’t believe you guys went out in all that snow. We’d never do that…but then again, we don’t go out much even in good weather. We see you have an Ernie Squirrel at your house too. We do indeed and this one is a young one. Odin, your energy exhausts even me!! Love the pic of you in the snow!! Austin, wait until spring, you’ll perk up! Thanks for the purrs. I don’t think I’d want to be out in 42 degree weather! Not because it sounds cold, but because I know I’d have to listen to my human complaining about how cold SHE is! She loves the east coast, but she is such a west coast kinda human. Sending lots of purrs to Merlin. My human knows how hard it is to work around the clock to keep those seniors going. Thanks for your much welcome purrs.